Spouses of wounded military members receive tools that help them overcome their challenges and heal their marriages. When their husbands were deployed to Afghanistan or Iraq, fighting in the war on terror, they worried constantly about their safety. They found tasks to keep busy—school, children, and chores. The hope of seeing their husbands again kept them energized. But then they got the call. They were just going about their normal daily tasks, shopping at the grocery store or picking their children up from school, when the phone rang. When they answered, they were told that their husbands had been injured. Life would never be the same. Some husbands return with severe physical injuries and often have to get used to using a wheelchair or prosthetics. Others return with injuries that aren’t as visible. 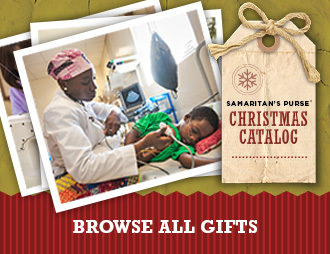 They suffer from traumatic brain injuries (TBI) and post-traumatic stress disorder (PTSD). These husbands often become withdrawn, uninterested, depressed, and angry. They may always be on high alert and skittish around people. “A lot of them go in a basement, go in a back room and do video games or watch TV or whatever they can to escape because they don’t know how to reengage,” said Linda Stephens, wife of Operation Heal Our Patriots chaplain Dan Stephens. Their spouses must become their caregivers and, for those with brain injuries, their memories, sometimes completely dropping their roles as wives. According to the Department of Veteran Affairs, between 10 and 18 percent of Iraq and Afghanistan veterans have PTSD. Because they don’t have visible wounds, it’s more easily written off. Many wives have found that people believe their husbands are just crazy or that they aren’t suffering from anything. 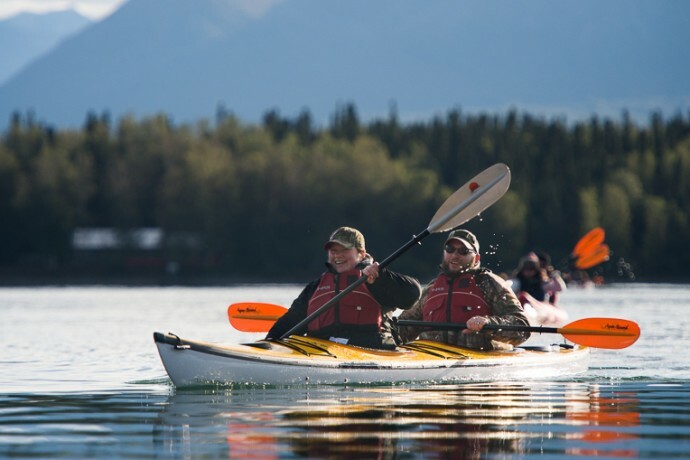 Justin and Bethany McGowan learn to kayak during their first morning in Alaska. Justin’s brain has many dead areas from his service, and Bethany has had to support him through doctor’s appointments and surgeries. At the end of the week at Operation Heal Our Patriots, they renewed their vows. Bethany said she has to remind Justin to do simple tasks, and if she wants to leave the house to do something like get her nails done, she has to start telling him every day two weeks in advance so he’ll remember. She said it’s difficult because it feels like he’s a different person every day. 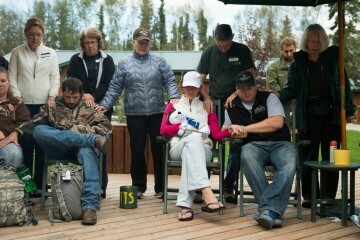 Kayla Bradley and her husband, Chris, attended a week-long retreat at the Samaritan’s Purse wilderness lodge in Alaska that is the cornerstone of Operation Heal Our Patriots the week before the McGowans. Kayla Bradley and fishing guide John help her husband, Chris, across the river for fishing. Chris uses a cane from injuries he sustained in Iraq. They were married about five months after Chris returned from Iraq, where he was a customs officer in the U.S. Navy. It was a year and a half later that they found out he had a brain bleed from a mortar round. Even then, her husband’s parents didn’t understand why he couldn’t move on. It might seem like life is easier for wives like Kayla because they married their husbands after they were injured. They knew what they were getting into. That isn’t always the case. Sometimes brain injuries don’t show up immediately, and even when they do, it’s difficult to understand the full extent of them. Many wives said that PTSD was rarely talked about when their husbands returned home, and they didn’t know what was wrong. It often wasn’t until their marriages began failing or they had trouble while training for another deployment that they realized they needed treatment. Even after treatment, life isn’t easy for these wounded veterans and their wives. Doctor appointments and injuries take over their lives. They don’t have enough support. Life doesn’t return to the way it was before the husbands’ injuries, and couples must work to find a new normal. Sometimes it’s trying to figure out how to sleep together when the husband has flashbacks. Sometimes couples must learn how to be around each other constantly after spending so much time away. The struggles put enormous strains on the marriages. Mary Dunn and her husband, Anthony, spent the week connecting with God and working on their relationship. Both spouses must give up dreams to make their new lives work. Sergeant Bert Blevins wanted a lifetime career in the Marines, but his PTSD and back injuries prevented him from continuing. Mary Dunn, who is married to Army Sergeant First Class Anthony Driscoll, gave up her career as a clinical psychologist to take care of him. “The wife is grieving the loss of the man that she knew; grieving the loss of the hopes she had for reunion post-deployment; grieving the loss of their shared expectations, hopes, and dreams for the future; grieving the loss of the father that was there for his children; and often grieving the loss of her own personal dreams for her career trajectory that is now aborted because she needs to take on the role of the caregiver,” Lori Fisher said. Operation Heal Our Patriots staff members pray over Justin and Melissa Bryant and Dave and Hildie Dietrich and the other couples before they depart. The staff will continue to support them via email contact and reunions. Wives often bear this burden alone. In a women’s session during the 13th week of the Operation Heal Our Patriots summer season, the chaplains’ wives asked how many of the women have female friends. Only three raised their hands. She suggested that wives of wounded veterans find hobbies that they can use to relate to other women. But she admitted that it’s not easy. Getting away to meet those people can be difficult, and finding people who understand is even harder. Operation Heal Our Patriots provides an avenue for women who are going through similar circumstances to meet each other and offer tips and guidance. It’s a step toward friendship for some of the women. 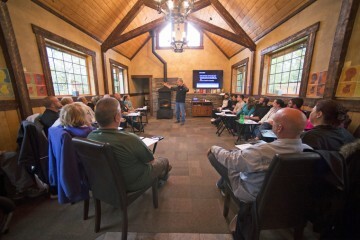 Samaritan Lodge Alaska, located in Port Alsworth, is designed as a retreat where military spouses can reconnect with each other and with God. Each week for 15 weeks, 10 couples have the opportunity to spend time together in the wilderness of Lake Clark National Park. For many, it’s like the honeymoon they never had. Sometimes it’s the first time the husband has been active in months. He is accomplishing things, and the wife once again sees him as her husband rather than just someone she has to care for. While it provides a much-needed getaway for the couples, Operation Heal Our Patriots is so much more. 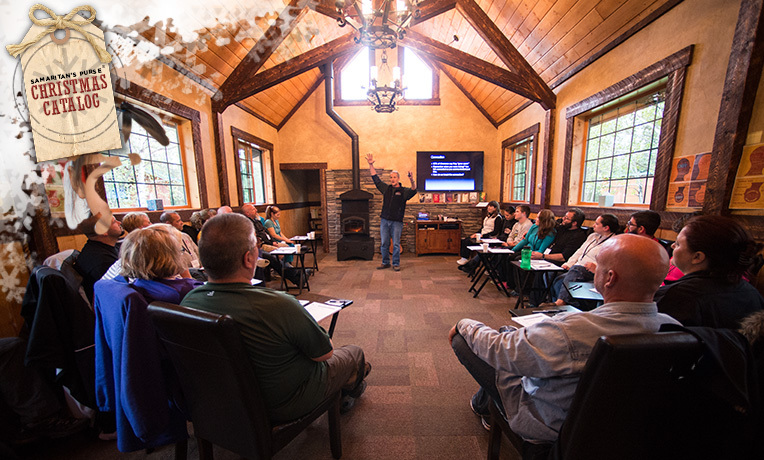 It gives wounded veterans and their spouses the tools to reconnect and heal marriages through biblically-based seminars that help strengthen their relationships with God and each others. After breakfast, Chaplain Dan Stephens teaches the couples about communication. Throughout the week, they learn about how their families, their personality types, and other things affect their communication with each other. Although Mary’s husband was already a Christian, she hadn’t accepted Jesus as her Savior until she talked with the chaplains. For the first time, she let go of her burdens. She was excited about being able to go to God with any difficulties she faced in her marriage. On the last day of camp, she and her husband were both baptized in Lake Clark. The chaplains and their wives teach sessions throughout the week about communication and other tools to help the couples appreciate each other better and forgive each other. Both of the chaplains were in the military, so they come from a place of understanding. Anthony and Mary were one of nine couples to rededicate their marriages at the camp during Week 14. One couple said they decided to do the rededication because after a year of arguing over a certain topic, they finally resolved it while in Alaksa. They said that without that resolution, their marriage likely would have ended. Many couples expressed a desire for a new start. Chris and Kayla Bradley kiss after they renew their marriage vows. 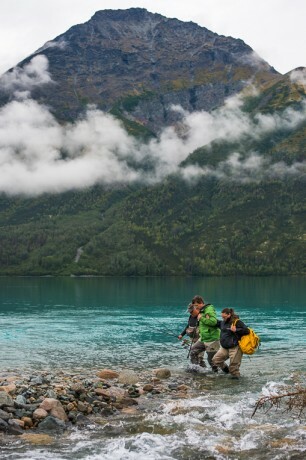 During their week in Alaska, they worked through an issue than had plagued their marriage, and they returned home feeling stronger and more connected. As these couples return home, they still face problems. But now, they have contacts with Operation Heal Our Patriots who they can talk to when life becomes too much. The chaplains and their wives communicate via email and social media with the couples. Before leaving, the couples exchanged their information and some planned trips to see each other. The support they feel and the love they learn is enough to save marriages.